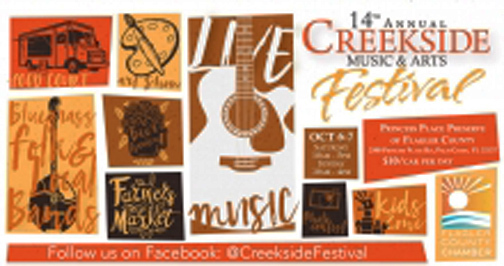 FLAGLER COUNTY – The 14th annual Creekside Music & Arts Festival continues Saturday and Sunday, Oct. 6 and 7 at Princess Place Preserve, sponsored by the Flagler County Chamber of Commerce. Held on the shores of Pellicer Creek, the two-day family-friendly festival features arts and crafts vendors, entertainment for the children, a variety of food selections, a beer garden and much more. Hours are 10 a.m. to 5 p.m. Saturday; and 10 a.m. to 4 p.m. Sunday. Admission is $10 per carload per day. In the entertainment category, on the main state there will be bluegrass, folk music featuring The Florida State Bluegrass Band, Passerine, Aslyn and the Naysayers, Seminole Ridge, Remedy Tree, Headed South bluegrass band and St. Augustine guitarist Sam Pacetti. Spotlighted on the second stage band are up and coming musicians playing pop, folk, honky-tonk, country and other selections. Historical demonstrations range from a blacksmith and fur trapper to pottery wheel creations. Hiking trails, kayaking and fishing are also available, and patrons are invited to tour the historic sites. A juried art show is also part of the two-day festival.